Take a step into the wild side of Alabaster Caverns State Park and spend a night in a cave. Water Cave is your destination and you will need a pre-paid reservation by calling the park office. Each party must consist of between three and 15 people, one of which must be a responsible adult over the age of 21. Each person is required to have a hard hat, three independent light sources, a long sleeve shirt, long pants (or coveralls), water, a first aid kit and moisture barrier (small tarp or drop cloth). 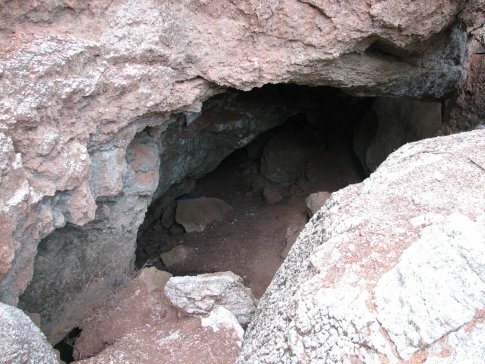 Electric lights are permitted in the cave, but no heating devices of any kind are allowed. A picnic table and grill are immediately outside of Water Cave and are strictly for the park's cave camping guests. Restroom facilities are located 1/4 mile away. $45. While every effort has been made to ensure the accuracy of the pricing listed above, prices are subject to change without notice. Located 6 miles south of Freedom on Hwy 50, 1/2 mile east on Hwy 50A, or 20 miles north of Mooreland on Hwy 50.